If you were one of 550 million people glued to a TV on July 20, 1969, you no doubt remember where you were when Neil Armstrong spoke those words. 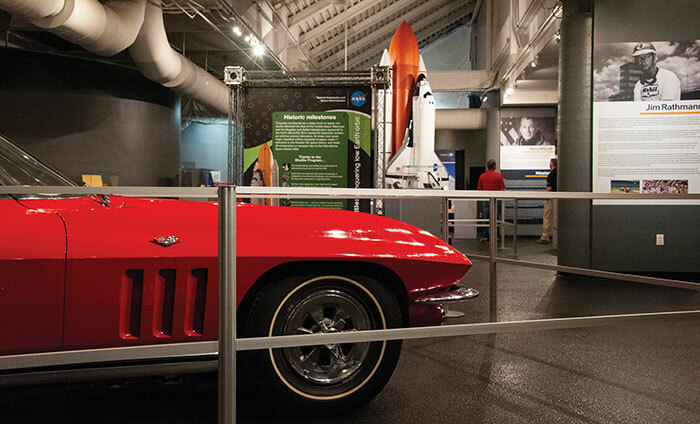 To celebrate the 50th anniversary of that historic happening, the National Corvette Museum (NCM) in Bowling Green, in conjunction with NASA and the Marshall Space Flight Center in Huntsville, Ala., is hosting “Gas Station to Space Station” through June 30. Put together to inspire and remind folks that no goal is out of reach, the exhibit explores the ongoing quest for interplanetary travel, explains how the lunar module landed on the moon, and what it takes to become an astronaut. “The connection between this historic event and Corvettes is one cool story,” says Katie Ellison, the museum’s marketing and communications manager. It turns out that America’s beloved sports car and the space program are linked because many astronauts drove those snazzy vehicles, and several astronaut-owned Corvettes are on display. When the very first ‘Vette rolled off the General Motors assembly line in 1953, Chevrolet wanted it to be the sleek, sporty car that everyone would lust after. So Chevy made sure a number landed in the hands of high-visibility celebrities. Back when astronauts were celebrities, Alan Shepard became a trendsetter when he drove a 1957 Corvette to work at the astronaut training center. On May 5, 1961, when Shepard became the first American to travel in space, GM President Ed Cole gave him a Corvette to honor his achievement. Shortly afterwards, Indy car driver and winner of the Indianapolis 500 Jim Rathmann, who owned a car dealership in Melbourne, Fla., became friends with Shepard and fellow astronauts Gus Grissom and Gordon Cooper and started a program to lease Corvettes to astronauts for one dollar a year. This is the reason that a number of ‘Vettes appear in the movie Apollo 13. A lot of astronauts liked the car so much they eventually purchased one. One of those belonged to Betty Skelton, the first female who applied and was tested for the NASA program. A pioneer in challenging many male-dominated roles, she set land speed records, paving the way for women in auto racing, aviation and astronautics, the theory and practice of navigating beyond earth’s atmosphere. Artifacts on loan from the Kentucky Museum at Western Kentucky University include the flight suit, helmet, boots and glove of Terry Wilcutt, Kentucky’s only astronaut. A Russellville native, Col. Wilcutt attended Naval Fighter Weapons School (Top Gun) and has flown on four space-shuttle missions. While at the NCM, you’ll also want to see the Corvette Cave-In exhibit that commemorates Feb. 14, 2014, when an enormous sinkhole opened under the museum and eight Corvettes dropped into the 30-foot cavern. Remarkably, all cars were extracted, in varying states of disrepair. Two years later, the exhibition opened and now features a detailed account of the natural disaster, photos of the excavation of the damaged vehicles, and restorations that include a 1962 black Corvette that is showroom-worthy again. To date, three cars have been repaired and much of the sinkhole has been filled. Visitors can get an idea of its scope though a viewing window into a 48-inch manhole and the outline of its breadth on the showroom floor. All eight cars are on display in approximately the spots where they were before the cave-in. Five still look exactly as they did after being pulled out. On the NCM website you can take a 360-degree virtual tour of the car-swallowing cave below. While visiting the museum’s 55-acre campus, be sure to slide into a Corvette for some real fun. Driving experience options include piloting a Corvette around a virtual track in a C6 driving simulator; riding in a vintage Corvette (weather-dependent, March/April through October); driving a Corvette, Camaro, or go-kart at the NCM Motorsports Park; and climbing in a ‘Vette with a professional driver at high speeds, called Hot Laps. You can even bring your own car and learn from a pro how to drive it as it was meant to be driven. Though most experiences are walk-in Monday through Friday, it’s always a good idea to reserve ahead, and all, of course, depend upon the weather. Corporate hospitality is an NCM specialty for meetings, sales staff perks, team building, and just plain fun. Half-day and full-day experiences can include catering, museum tours and of course, zooming around a track in a sassy, classy Corvette.